A1WebStats is a website visitors analytics system that allows businesses to go much deeper than Google Analytics, but in a MUCH friendlier/accessible way. Thousands of our customers started off with the free 30 day trial before choosing to continue with a paid subscription. Getting a sales pitch (we never ever sales pitch A1WebStats). Cost (there are no costs unless choosing to continue beyond the 30 day free trial). Most customers who choose to continue after the trial pay £59 per month, and our business model relies on every customer gaining a strong return on that investment month by month. Our customers can cancel instantly at any time so we very much encourage using A1WebStats for more than the obvious tracking of companies that visited their website. Here are links to the top reasons why people use A1WebStats and how they may apply to you. All of these benefits are provided free within the 30 day trial – complete with no sales pitch guaranteed. See the names of identifiable companies that went to your website, what they looked at page by page, plus what brought them to your website. 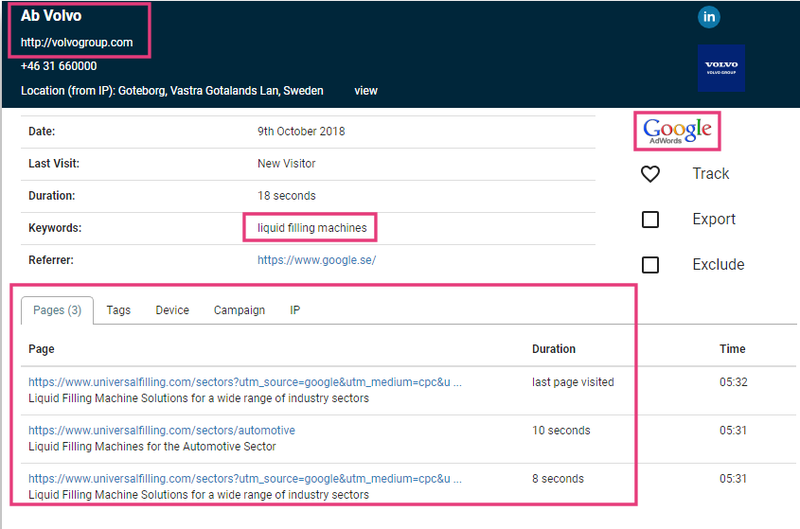 Identifying the visitors via Google Ads, who don’t click further than the landing page, plus whether the weakness is with the Google Ads, the website landing page, or a combination of both. Also, being able to identify certain types of clicks (e.g. from the education sector) and how to avoid wasting budget on those. Digging deep into visitors to product or service pages, weeding out ‘noise’ data and identifying opportunities to strengthen those parts of the website. Creating very refined views of the page by page visits of website visitors. For example, all visitors from one or more countries, identifiable as companies, who got to page X and Y, but not page Z. Advanced filtering produces valuable insights into website visitor patterns. For each enquiry that you get from your website, you can gain insights into what each of those enquirers looked at page by page, plus what brought them to your website. Identify the people who go deeper than the landing page from your email campaigns. Then nurture them further, based on what they looked at within your website. Track all online sources of traffic to your website, including what each visitor looked at page by page. See where those social media (paid and organic) clicks go (page by page) after they landed on your website. The list above are the top reasons that people use A1WebStats. You may have different objectives of what you’d like to achieve from your website visitors. Please do contact us to explain what you’re trying to achieve, and we’ll tell you whether or not an A1WebStats trial will help you to gain insights into that. Don’t want to trial A1WebStats on your own website yet? We can take you through a demo of another website, just to give you a feel for how the A1WebStats system can help gain more results from website visitors. That demo would be complete within 15 minutes. All you need to do is click on this link, complete your details, and then join the screenshare on that date/time – https://a1webstats.appointlet.com/s/a1webstats-system-demo. Identify companies that have been to their website. Follow up with companies of interest. Within your free 30 day trial you will receive daily emails showing you those identifiable companies. You can also see deeper information about what those companies looked at page by page. Get instant alerts when they return to your website. Tag them as prospect, customer, competitor, or any tags that you want to create. Easily forward their visit history onto other people within your business. You can see a lot more about how A1WebStats helps you use data about visiting companies by looking at the resources within our section https://www.a1webstats.com/what-it-does/visiting-companies/.Within that section is this page, which shows you the basics of receiving information about companies that have visited your website: https://www.a1webstats.com/what-it-does/visiting-companies/basic-reporting-on-visiting-companies/. There is a thing known as the Google Stupidity Tax. It thrives on advertisers who don’t look closely enough at what is and isn’t gained from their Google Ads budget. A1WebStats shows you every single click from Google Ads, including what those people did (or didn’t) click through to after landing on your website. Within your free 30 day trial you will see data related to Google Ads traffic. Better than that, you will have free access to our experts, who will help you to interpret that data. Nine out of ten times we will identify Google Ads budget wastage, which is information that you can benefit from, whether or not you continue beyond the trial. Google Ads set up incorrectly. Landing pages/supporting pages on the website not doing their job properly. A combination of the above (this is most common). Many businesses think that their Google Ads gets them a good return on investment.Our job is to highlight where there are more opportunities to get a better return on investment. This part of our website focuses more on getting results from Google Ads with A1WebStats: https://www.a1webstats.com/what-it-does/marketing-roi/google-adwords-return-investment/#basic-adwords. Forget chasing companies that visited your website. You’ve probably lost them as opportunities already (see this page for more insights into that: https://www.a1webstats.com/what-it-does/visiting-companies/which-people-from-companies-have-visited-my-website/). Wouldn’t it be better if those ‘company’ visitors proactively made contact with you, because the website gave them what they wanted? A1WebStats helps you to make your website strong enough so that more people contact you, instead of contacting your competitors. At the very core of A1WebStats is the ability to drill down to individual product or service pages, exploring every single visitor to those pages, and building an understanding of how well (or not) they engaged with your website pages. That data leads to insights, which lead to activities that strengthen your website.We live and breathe website conversions – during a 30 day free trial of A1WebStats you’ll have the opportunity to discuss (via a screenshare call) products or services that you want to gain more enquiries about. Our experts will instantly spot opportunities that you can benefit from. All totally for free, whether or not you continue with A1WebStats after your free trial. This level of filtering isn’t available in any other website visitors analytics system – including Google Analytics. You choose what data patterns are of interest to you and then use advanced filtering to extract data related to those patterns. Then, if you wanted to, you could create a template to re-use in the future, or have set up as automated reports sent instantly, daily, or weekly, to people you choose. … and who came from Google Ads. Think of a website visitors pattern that interests you, and A1WebStats will provide you with useful insights. Advanced filtering will let you uncover data that is sometimes uncomfortable to see, but when you view data in that way, you then have the opportunity to make changes to the website that will help to improve the conversion rate from website visitors.During a free 30 day trial, we can show you how to use advanced filtering, using your own website visitors data and patterns that are of interest to you. In short, anything you want to know about your website visitors, you can do with advanced filtering within A1WebStats. When you gain enquiries (via contact form, email, or telephone), they’re always welcome (except the spam ones!). Even better is when you can dig into what those enquirers did on your website BEFORE they made contact with you, including what brought them to your website (e.g. Google organic search result, or a Google Ads click). By better-understanding their path towards enquiry, you are better-enabled to respond to their enquiry. In many cases you will identify that people looked at pages that weren’t mentioned in their enquiry, potentially offering further sales opportunities for you. During a free 30 day trial we can take you through how to link enquiries you’ve gained back to the corresponding data within A1WebStats.For further information about linking enquiries back, please see our section https://www.a1webstats.com/what-it-does/enquiries-linking/. What date/time each person opened your email. What date/time each person clicked on a link within your email. Unfortunately, most email campaign systems won’t show you what those people looked at page by page after they landed on your website. If you knew what they looked at page by page you’d be able to identify the people who engaged more with your website and so could further nurture those people.A1WebStats allows you to do this and we can demonstrate that during your free 30 day trial. Further information about tracking email campaigns beyond the click can be seen on our page https://www.a1webstats.com/what-it-does/email-marketing/email-marketing-clicks-tracking/. You may have a general feeling that your marketing is working OK.
A1WebStats can show you precisely what’s happening with any of your marketing spend that drives people online to your website. Paid adverts via Google, Bing, and other search engines. Organic traffic from search engines, including the pages people are landing on. Paid or organic traffic from social media (Facebook, LinkedIn, Twitter, and more). Online directory listings that you pay for. Blogs that are intended to gain traffic and hopefully people clicking onwards into the website pages. Outbound sales calls. Yes, you can use A1WebStats to gain more benefits from those calls. Within a free 30 day trial of A1WebStats, you have the opportunity of a free screenshare/call, during which we can focus on the marketing you spend time and budget on, and what the data is saying about what’s gained (or not) from that marketing.You may be interested in this section of our website which covers the above in more detail – https://www.a1webstats.com/what-it-does/marketing-roi/. Many businesses put a lot of resource into social media visibility. While that has some unmeasurable benefits (e.g. brand awareness), you CAN measure what happens to visitors after they click through to your website from your social media visibility. Whether that’s Facebook, LinkedIn, Twitter, or other social media. Or whether it’s paid or organic traffic. A free 30 day trial of A1WebStats will show you (page by page) exactly what happens to each person who comes to your website via social media channels. At A1WebStats we are a genuinely no sales pitch organisation. Be open minded about website visitors traffic. Have a screenshare/call with us during your trial. Feel free not to buy after the trial, but feel that you’ve benefited from the data and our free expert insights. If you have any other questions, please do contact us – we’ll be happy to help.